Is it possible to give new life to old jeans? Home / Needlework / What can be made of old jeans? In the XXI century jeans worn by all. But what to do if you have them somewhere a little bit broken, and throw a pity. What can be done from old jeans? A lot of things. Do not think of old jeans can only make a skirt or shorts. 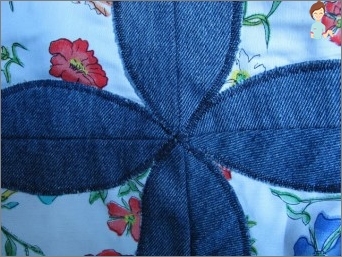 Thanks denim can make changesin the interior, make a toy, do koshёlek or handbag. Found their way into this fabric and jewelry. 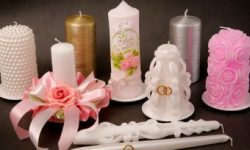 The most popular are the variety of earrings, hoops, bracelets, beads for the manufacture of which, you can use old jeans. So, the most simple opportunity to give yourjeans new life - it make them shorts. To do this, you only need to cut the leg at the height that suits you. Do not forget to treat the edges. The method of treatment can also be different. 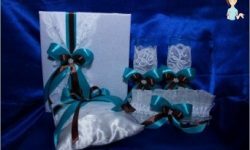 You can just bend and stitch, and it is possiblemake fringe or lace to decorate. 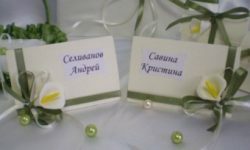 It is useful to be, and other decorations. Alternatively, you can sew a few stripes, which can be bought in any clothing store. Another option rework old jeansa skirt. Here, too, you cut off the desired length. Then you need to unpick all the seams in between leg. Then stitch front and rear portion of the skirt. Often in the process of transformation in jeans skirtuse a variety of other tissue insertion. Then, the product becomes more original. If you have a small patch, you can priladit their pockets on the back - will look very interesting. If you have broken leg below the knee, then there is another option. 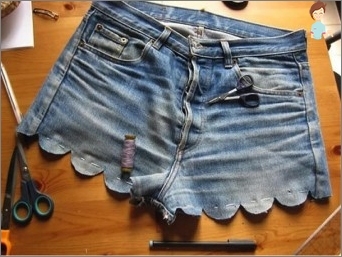 Here you will not remake jeans into something completely different, and change their style. You have a hole just below the knee? Nothing wrong! Take the scissors and cut the holes from the leg to the bottom. Now we need to take a bit of fabric, preferably a few shades lighter, and paste between the cut edges so as to obtain flared. You can sew lace on the inserted tissue orsew some lace. Thus, you eliminate the annoying hole on your favorite jeans and get exclusive pants. 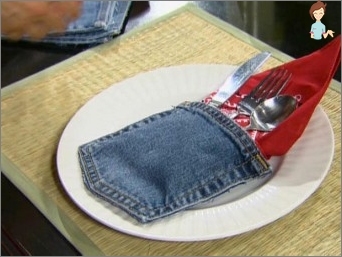 In the case where the jeans just rubbed or faded, the problem is solved more easily. You can buy in specialty stores special dye denim paint and a specific place. Or you can change the color completely. It all depends on your imagination. Now let's look at the most interesting opportunities to remake old jeans. Here we look at two types of bags that can bemade from old jeans - a small handbag for lunch (or makeup) and a large, very roomy bag with which you will be able to go even in the supermarket. So, a small handbag. For its manufacture you will need a pair of old jeans, thin strap from which we will be doing the harness. For shleek also be used denim or strung on a thick thread large beads. Sewing can be both manually and on the sewing machine. 6. Do not forget to insert the lock or sew on a button. And now, your little cosmetic bag ready. Advice on decoration, we give you will not, you can then rely on your taste and do anything. Now pay attention to sewing a large bag,which can also be used as a business. 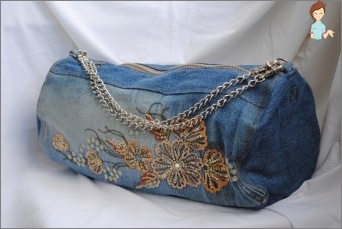 In order to make this bag you will need: old jeans, sewing, sewing machine and a little patience. To get started make blanks: Cut the part of the jeans, which is above the division into trousers. In order that the fabric is not a fringe, cut the severed edge. Now you can sew the bottom. Do not forget that you need to sew the inside. Once you zashёte bottom, cut two narrowstrips from the remaining tissue and make of them handles for your bags. Sew get a handle to the bag inside out. Do not forget to sew the lock. That's all your big shopping bag ready. If you are in your home a huge amount of old jeans, then there is a great opportunity to make It covers for chair or sofa. To do this you need to denim, the fabric for the lining, thread, a lot of time and a great desire. Backing and denim cut into equal size squares. The size of the squares can be as you like, in this case, it is not very important. Now add together the 2 square lining and denim so that lining was inside, and denim with both sides covered it. That is, you should get some kind of Footprint: square jeans, 2 squares lining the square and jeans again. Now prostrochite get the items covered. The line must be at a distance of about two centimeters from the edge. The resulting edge you need to make fringe. To achieve this, you can use all the means at hand: you can finely chop finely, you can brush to comb the wool, or come up with any other way. After the fringe of each item you will find enough, start linking all the pieces into one big beautiful blanket. The same principle can be made and the carpet. If you have used most of the oldjeans, but you still trim and pockets, you can make an organizer for storage of small things. Make a simple organizer. You will need solid piece of thick fabric on the basis of an organizer, a few pockets, and strong thread. For starters treat the edges of the base fabric, you can even sheathe their stripes denim. Carefully sew pockets. All your organizer is ready, you can hang it in a place convenient for you and add to whatever you wish. From denim can also be made entirelyunique jewelry. For example, in order to make a lovely necklace you need to have the old pair of jeans, a few beads with large holes, a small piece of ribbon, a special hot glue. So, cut out a rectangular piece of denimtissue and, using hot glue, twist it into a tube. The resulting tube cut into pieces about 1 centimeter in height. It is our petals of flowers. Now cut out a random piece of denim fabric and glue it to the pitch. Do not forget to sew in the middle bead flowers. When the glue dries, carefully cut loose tissue around the flowers. By the edge of the fabric sew a satin ribbon, which can be strung a few beads if desired. Thus, you have a stunning necklace, perfectly suitable for everyday clothing style. All narrated above - it is only a small partthat can be made from old jeans. So, grab your old jeans, connect the imagination and create something new and absolutely unique. Good luck!